Many proposals listed in this paper recommend eliminating or reducing programs that are either partially or entirely federally funded. Undoubtedly the wisdom of such proposals will be questioned. Skeptics will say, “Why turn down our share of federal funds? This is essentially free money. We should take it while we have a chance.” And at first glance this appears to be a rational reaction. Yet, when one examines the issue more carefully, one sees that refusing federal funds is not only rational, it is imperative if we expect to get Michigan’s budget under control. Over the past 30 years — since the beginning of Lyndon Johnson's “Great Society” — federal funding as a percentage of Michigan's total budget has increased dramatically — as demonstrated in Table 1. Indeed, for fiscal year 2003 federal funds will account for over 29 percent of the total budget. 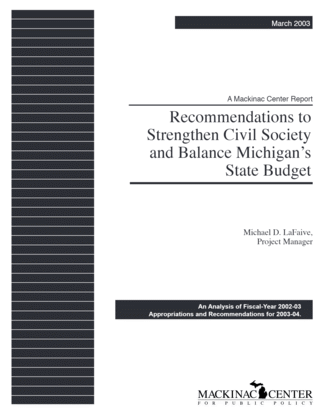 The state of Michigan cannot neglect such a large portion of its budget and expect to reverse the trend toward ever-larger and ever-more intrusive government. Those who believe that state government can, and should, be significantly downsized must realize that the only way to do this is to cut programs that are both funded from the general fund and from federal revenues. Michigan needs to set an example for all the states. It needs to begin the long process of reclaiming power from Washington. And the only way to do this is to realize that federally funded programs must be held to the same scrutiny that non-federally funded programs are. If they are not, real reform cannot take place in Michigan, or in any other state. Where Do Federal Funds Come From? One of the most destructive myths regarding federally funded state programs is that these programs are “free” to the citizens of Michigan; that they are essentially gifts. Michigan citizens also are U.S. citizens. They pay federal income taxes, federal capital-gains taxes, as well as numerous other federal taxes. It is these taxes that pay for Michigan’s supposedly “free” federally funded programs. The only way to lower the federal tax burdens of Michigan citizens and, in the process, help achieve sustained economic growth, is to eliminate or reduce the size of the programs these taxes pay for. That means that all federal programs operating in Michigan must be considered “on the table” for downsizing or elimination.